At Delacon we use a simple formula to determine how many numbers are required. This formula is: divide the number of visitors each hour by 60 minutes and then multiply by the time spent on the site. For example, if you have 240 visitors to your site each hour, and each visitor stays on the site for less than a minute, then our call tracking solution would require four numbers (240 divided by 60 multiplied by 1). 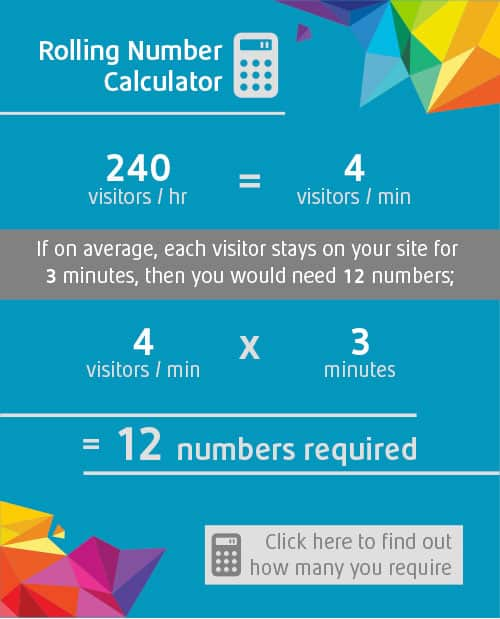 If each visitor was staying for an average of two-and-a-half minutes, you would need 10 numbers (240 divided by 60 multiplied by 2.5). For more information about using Google Analytics to find out the numbers of users on your website or how to build a segment to calculate the number of users on a specific web page, click here.